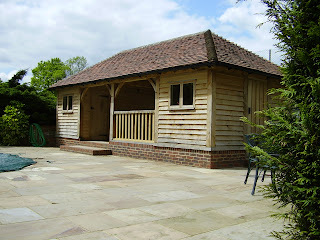 Poolhouse in Kent, 2005, green oak frame and cladding, with tiled roof. Built alongside Simon Scott, in Hever. Angled linkway between barns, again at St Issey with Jamie Lovekin, 2006. Forestry Barn at the Royal Cornwall Showground. The first green oak frame that I worked on, 2003, it has an interesting range of infill styles, including cedar cladding, lime render, woven split oak and wattle and daub. Great to see it come to life every summer during the show. Pottery workshop in St. Kew, another project with Jamie Lovekin in 2005/6. The potter has a fineworkshop, I have a fine teapot and mugs.